2/1999: The Water Works Conservancy has proposed a plan to create Science and Education Tech. Center connected with Historic New Bridge Landing proposed greenway to “recreate Hackensack River habitat” and 13-acre park. 8/2000: After several years of studying alternative uses for the site, Bergen County, Oradell, and the Water Works Conservancy have begun negotiating a three-party agreement for the County to develop the island as a passive park and to transfer the historic buildings to the Conservancy for restoration as a museum and environmental education center, with Oradell taking over if the Conservancy should fail. The plan includes the County’s transfer to the Conservancy of a $575,000 preservation grant it received from the N.J. Historic Trust in 1997 for stabilizing the historic buildings, as well as about $766,000 remaining from the Hackensack Water Company’s $1,000,000 donation grant. 1/2001: The site has received a Save America’s Treasures grant. 2001: Oradell has decided that it cannot assume the financial burden of taking over the complex if Conservancy restoration efforts fail, and has pulled out of the negotiations. 6/2001: The Hackensack Water Company has been nominated to the State Register of Historic Places and sent for National inclusion. 8/2001: The Hackensack Water Company has been listed on the National Register of Historic Places. 10/2001: Bergen County has filed a request to demolish the site for creation of an amphitheater and open-air ruin/public sculpture garden on the site. 02/2002: The NJ Historic Sites Council has voted unanimously to reject Bergen County’s demolition request, and instead, recommends the creation of a preservation plan. 2008: Oradell has received a grant from the New Jersey Historic Trust for Phase I stabilization to improve safety and arrest accelerating deterioration. 2009: Oradell has received a second grant from the New Jersey Historic Trust. This grant will help fund the preparation of a preservation plan for the water treatment building and pump house. 11/2009: After years of deterioration, it appears that Bergen County is commencing planning for the water works site. A series of public discussions and a design charrette were held on November 14. 4/2010: An April 8 public meeting will delineate the steps necessary to preserve the Waterworks buildings and develop Van Buskirk Island as a county park. 3/2011: Oradell has secured a third grant from the New Jersey Historic Trust, this time for a $704,834. This current grant will help fund the stabilization of the water treatment building and pump house. 5/2011: Bergen County is undertaking stabilization and restoration work at the Waterworks. Currently, attention is focused on stabilizing the chimneys. There is hope that public will be provided limited access to some of the Waterworks buildings as early as fall 2011. 12/2011: County funding that was secured to match the recent NJHT grant has been redirected. The site was slated to receive $500,000 in Bergen County Open Space funds last year, however, that money now appears to be going to the Borough of Saddle River for the purchase of land for use as a parking lot. If the county money is not reinstated for the Water Works, the site could lose the NJHT grant as well. The site that the Hackensack Water Company occupies was, at one point, the highest navigable point in the Hackensack River. The red brick complex includes clusters of buildings with cantilevered roof lines, Victorian oval windows, gables, and a square monitor tower, with some buildings dating to 1881. The Water Company has a massive unseen infrastructure two levels below ground. The 1882 brick pumping station designed by Charles Brush features classical proportions and Romanesque detailing. 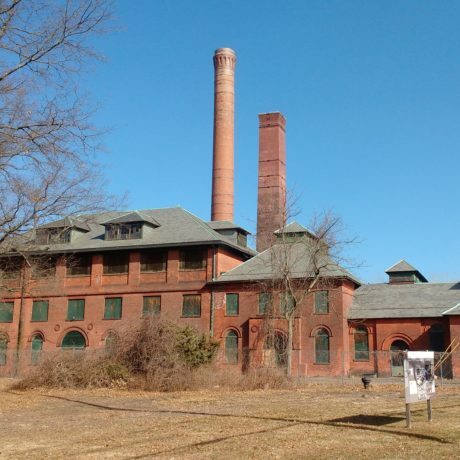 An impressive group of structures, the Hackensack Water Company is considered an American Engineering marvel for its historic architecture, steam pumping equipment, and its role in the development of modern water purification.